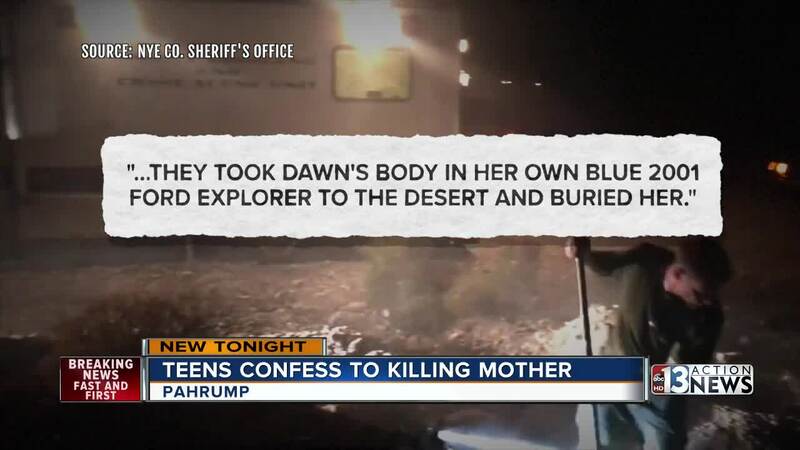 2 Pahrump teenagers have admitted to killing their mother. The Nye County Sheriff's Office has released video related to the crime. Two teens were arrested in connection with the brutal stabbing death of their mother after she was initially reported missing in July. Nye County Sheriff's deputies responded to the 6300 block of Wedgewood Street in Pahrump on Tuesday where they met the two boys, identified as 17-year-olds Michael Wilson and Dakota Saldivar, who said their mom, identified as 46-year-old Dawn Liebig had simply disappeared and had not heard from her. Deputies noticed inconsistencies in their story and conducted additional interviews. The teens then told police Liebig was suicidal and requested assistance with her suicide. They told deputies, at her request, they stabbed her to death. One of the teens then led detectives to a shallow grave in the desert where Liebig's body was found. The murder weapons were also found after direction from one of the boys. According to the sheriff's office, the teens then confessed that they had a fight with their mother on July 19. The boys told police they were tired of her parenting style and demands on them. They told police they waited until she was asleep to attack her. The attack lasted for about a half hour. The teens also tried to justify the killing by saying she wanted to be with her deceased sister. Wilson and Saldivar were arrested on charges of open murder, conspiracy to commit murder and domestic battery with a deadly weapon.